Man Fu Yuan at Intercontinental Hotel Singapore, is one of Singapore's top Chinese sestaurants. Diners are drawn not just to its classic Cantonese cuisine but also to their impeccable service and welcoming dining environment. And tonight, I'm here to experience a Chinese New Year Lo Hei dinner at Man Fu Yuan, ushering in the Year of the Goat with a lavish spread. Introducing the Man Fu Yuan's Salmon & Japanese Hokkigai Yu Sheng with Ponzu Shoyu ($98++ small, $148++ Large), perhaps one of the biggest or even the biggest Yu Sheng that you may ever encounter. 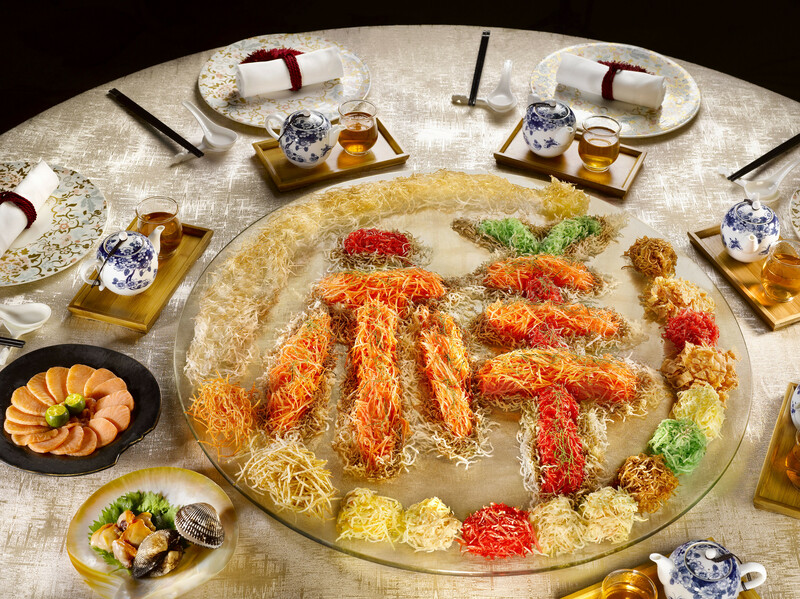 No more wasteful spillage of Yu Sheng as the revolving "plate" itself is now big enough to hold them all. 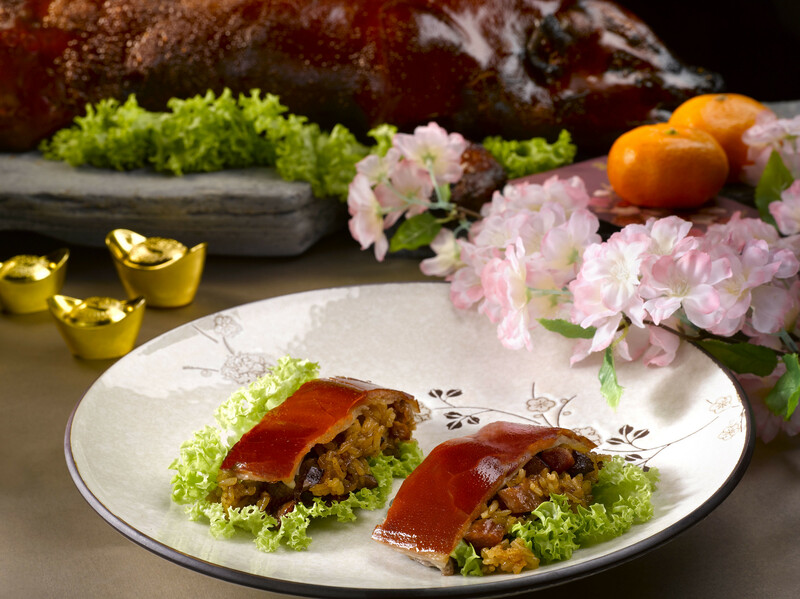 The usual crispy Golden Pillows have been replaced by the 'gold plated' cereal flakes resulting in shimmering Yu Sheng. I thought that was beautiful. I was so glad that the Yu Sheng was not inundated with the ponzu shoyu sauce which happen often but just faintly coated by it. Every bite was refreshing with extra crunchiness lent by the Japanese Hokkigai. It was so moreish that I had it throughout the evening, an add-on to the subsequent dishes. 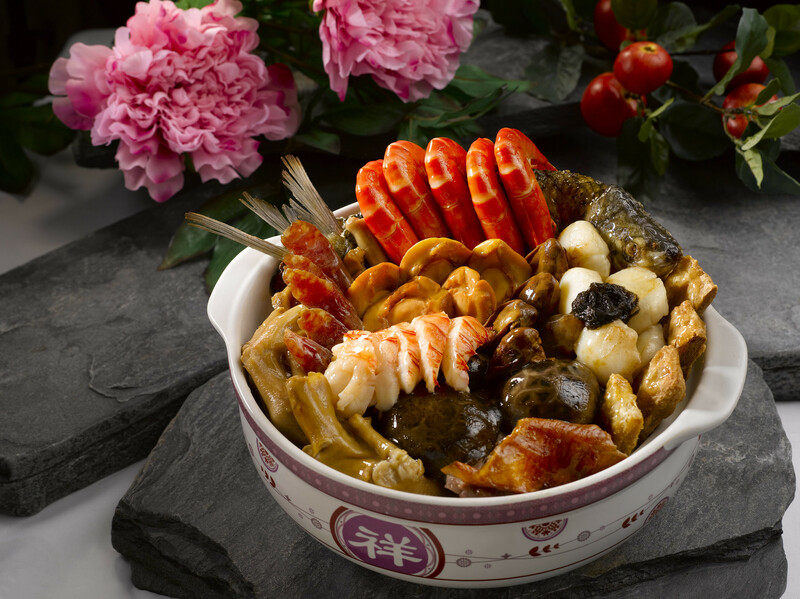 Man Fu Yuan's Deluxe Treasures Pot ($428 ++ for 5 paxs) is filled to the brim with 23 premium ingredients such as whole baby abalone, sea cucumber, fish maw, goose web, scallops, and preserved meat sausage, all braised in a flavourful broth. It comes in an exclusively designed claypot as a collectible for the diners. 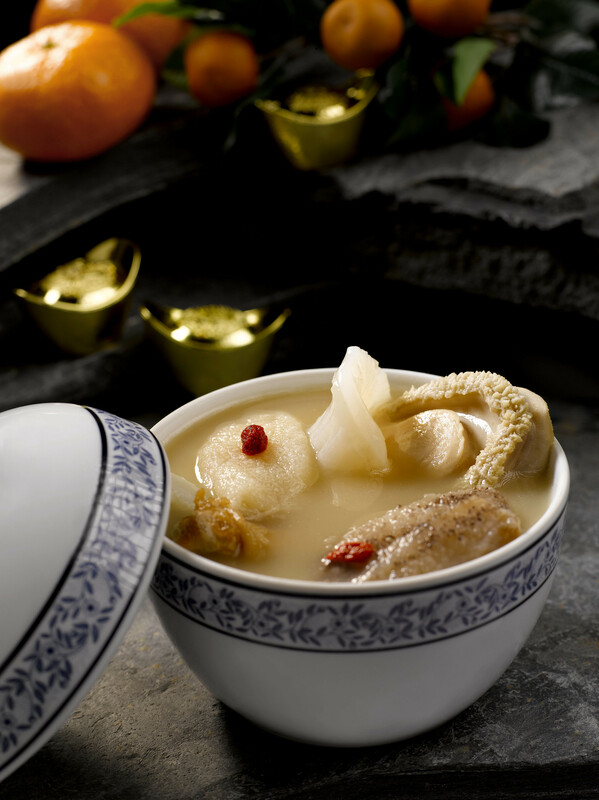 Double Boiled "Fu Zhou" Buddha Jumps over the Wall ($98++ per pax) is another delicacy carrying ingredients like whole abalone, sea cucumber, fish maw, dried scallops, deer tendon and panax ginseng. Cooked over low heat for 48 hours, you can imagine how flavourful and nutritious the broth can be. Talking about collagen, you must drink up every single drop of the broth! Double Boiled Fish Maw, Bamboo Shoot, Chinese Cabbage with Dumpling in Superior Stock ($365++ for 5 pax) The huge dumpling was packed with prawns, with a relatively light tasting broth. I thought this is quite a nice change after the dishes with a much heavier taste. Braised Australian Green Lip Abalone and Chinese Mushroom with Seasonal Vegetables ($128++ per pax). The abalone was braised in abalone sauce for 48 hours, resulting in a rather rich and dense texture. I particularly like the sea cucumber that comes with it, it was so soft and tender that it almost melted in my mouth. Braised Beef Brisket with Radish. The brisket cubes were extremely tender, every bite was almost effortless. Steamed Red Garoupa in Homemade Black Bean Sauce. Fish has always been my favourite and this did not disappoint. It was light and tender with a subtle sweetness that was being teased out by the homemade black bean sauce. What I like about homemade sauce is that I can taste the robustness of it without the unpleasant aftertaste of an artificial flavouring. French Lobster Salad on Rock Melon with Sautéed Wagyu Beef, African Abalone and Sake Crab Meat. This cold midway appetiser came at the right time. Like a wisp of fresh, cool air in Summer. It cleared my palate, giving it another round of stimulation in preparation of what's going to come next, Barbecued Whole Suckling Pig with Wok-fried Glutinous Rice ($488++). The golden brown caramelised skin was almost fat free, and a gentle thug released it from its meat. Ever bite sent off a satisfying 'crack'. I couldn't believe that I could still stomach the entire thing after all the dishes above. I was told that the team just makes it better and better as the years go by, as they slowly master the essence of it. The Wok-fried Glutinous Rice which was loaded with cubes of preserved meat was equally yummy and pair very well with the suckling pig. Lastly the finale, Double Boiled Bird's Nest in Whole Coconut. I inhaled deeply, allowing my senses to take in the sweet smelling, milky scent of the warm coconut that perfumed the room. This is the perfect dessert to end this cold evening. It is light and soothing to my filled appetite. Along side the Bird's Nest were some samples of their Golden Egg Custard Pastry ($38+ per jar), and their new Koi Fish Nian Gao ($56+) of mango and pineapple flavours. 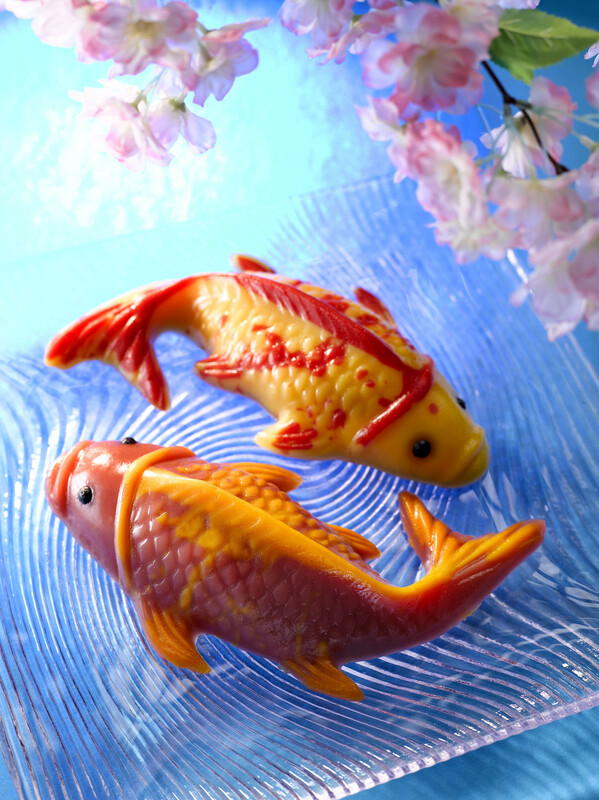 Something new and interesting to add on to your CNY stocks for home visits. If you prefer to stay in to celebrate with your family, you may want to check out Man Fu Yuan's Dine-at-home takeaway delicacies, meant for you to have a taste of their creations at the comfort of your own home. Find out more at their website.